Marble Arch is a white marble monument at the western end of Oxford Street, near Speaker's Corner, Hyde Park. (It is actually located on a traffic island at the junction of Oxford Street, Park Lane, and Edgware Road). 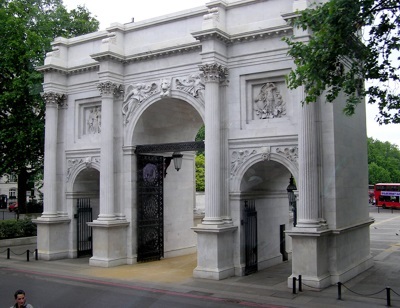 Marble Arch was originally designed in the 1820s. Its design was based on the Arch of Constantine in Rome, and the Arc de Triomphe du Carrousel in Paris. Construction was completed in 1833, and Marble Arch was erected on The Mall as a gateway to Buckingham Palace. However, in 1851, it was moved to its present location. The area in the general vicinity of the arch, is also known as "Marble Arch", and the name "Marble Arch" is also used to identify a London Underground station on the Central Line. The nearby cinema, Odeon Marble Arch, was for many years home to the largest cinema screen in London - 75 feet (23 meters) wide, although today the cinema is a mini-plex multiscreen cinema. One point of historical interest is that the site where Marble Arch today stands is very close to the site of the famous Tyburn gallows (also known as the Tyburn tree), which was used for public executions from the late Middle Ages until 1783. The actual site of the gallows is marked by three brass triangles mounted on an island in the middle of Edgware Road at its junction with Bayswater Road. It also known that the origin of Speaker's Corner arises from the history - before execution, the condemned were allowed to freely address the crowd before being executed.